Renowned for his fine musicianship, David Hill is widely respected as both a choral and an orchestral conductor. He became The Bach Choir’s ninth Musical Director in 1998; he is also Associate Guest Conductor of the Bournemouth Symphony Orchestra, Music Director of Leeds Philharmonic Society and Principal Conductor of Yale Schola Cantorum. Born in Carlisle in 1957, David Hill was made a Fellow of the Royal College of Organists at the age of 17, and won an organ scholarship to St John’s College, Cambridge where he served under the direction of the late Dr George Guest. Since Cambridge, David has held the posts of Sub-Organist at Durham Cathedral, Master of Music at Westminster Cathedral, Master of Music at Winchester Cathedral, Director of Music at St John’s College, Cambridge, and Chief Conductor of the BBC Singers. David is in great demand for choral training workshops worldwide, and his handbook on the subject Giving Voice was published in 1995. He is a choral advisor to music publishers Novello, for whom he has edited a number of publications including the carols anthology Noël!, and he regularly contributes articles to Choir and Organ. As an organist, he has given recitals in most of the major venues in the UK and has toured extensively abroad. David Hill’s broad-ranging discography of over 100 recordings, spanning repertoire from the Renaissance to the present day and including many award-winners, can be found on the Decca/Argo, Hyperion, Naxos and Virgin Classics labels. The third in his English series for Naxos with The Bach Choir and the Bournemouth Symphony Orchestra – Delius’s A Mass of Life – was widely acclaimed on its release in 2012 and won a coveted Choc de Classica. With The Bach Choir David Hill has contributed to the film sound tracks of Kingdom of Heaven, The Chronicles of Narnia and Robin Hood. 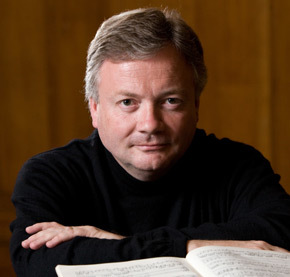 David Hill has appeared as guest conductor with many of the leading choirs and orchestras in the UK and abroad, including the Minnesota Orchestra, Netherlands Radio Choir and RIAS Kammerchor, Berlin. His commitment to new music has led to him commissioning works from leading composers including Judith Bingham, Judith Weir, Carl Rütti, Francis Pott, James MacMillan, Philip Moore, Naji Hakim, Philip Wilby and Jonathan Dove. David was appointed a Member of the Order of the British Empire (MBE) in the 2019 New Year Honours for services to music.